I bet you never thought you would want to have control over your customer's router! Now-a-days it's critical for you as the integrator to either work very close with a company's IT team, or in many cases to personally help the customer determine the best router for a secure and effective surveillance setup. How many times have you struggled with your customers' consumer routers and become frustrated with the limited feature set, clunky GUI and lack of security? Ever wished to quickly setup remote access to your cameras, but your customer's router refused to cooperate? Maybe you wanted to separate your cameras from the rest of the network with a dedicated VLAN, to prevent anyone from messing with your installation. DrayTek makes it extremely simple to set up a secure network with the perfect building blocks for your customers' data, voice and surveillance solutions. DrayTek routers are flexible enough to set up any network scenario a company may need with minimal complications. With an intuitive GUI and easy setup wizards, they require no formal training or specialized technicians to install. 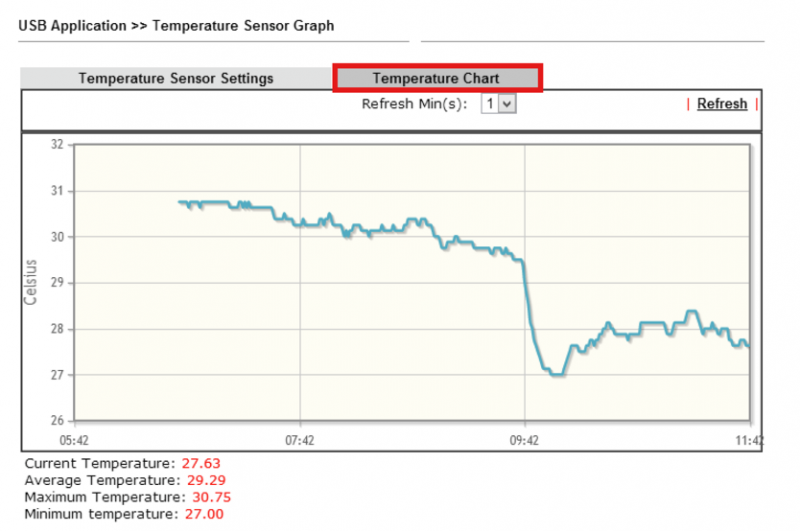 You can even set up these routers with USB Temperature Sensors to monitor the server room temperature. The router will email you if the temperature rises above the acceptable threshold, thus alerting you before any physical damage can occur to your server room equipment. This is a great add-on feature that you can offer your customers if they do not have physical sensors installed to monitor environmental threats. A surveillance solution needs a lot of bandwidth upstream for monitoring cameras and may need multiple Internet links to accomplish overall load. You need a router that can easily load-balance between different types of WAN connections like DSL, cable, fiber etc to ensure you never run out of bandwidth. The latest DrayTek routers also include LTE support, which comes in handy during a security breach, even if the DSL line, fiber or cable connections are sabotaged. One of the best VPN routers in the market according to Network World, DrayTek lets you easily connect to your cameras without any messy and insecure port-forwarding. What's more, they now offer a free VPN dial-up tool for use on Windows and Mac OS, as well as iPhones and Android phones; so you can easily connect to your cameras on the go. All these features are built-in on DrayTek routers, without any hidden costs or complex licensing, making them the perfect routers for any surveillance project. To top it off, DrayTek's ACS Centralized Management tool enables integrators to remotely monitor hundres of customer routers. You can proactively manage any video quality or bandwidth issues that may arise over the years. Check out ABPTech's events for our next DrayTek training sessions and technical webinars. For more information on all that DrayTek can do, go to the DrayTekUSA website.